The M831 Troop Transport is a ground vehicle based on the chassis of the M12 "Warthog" Force Application Vehicle. Like the rest of the Warthog series, the M831 is designed and manufactured by AMG Transport Dynamics. The M831 Troop Transport contains no armaments of its own. Instead, it features an extended tray covered in a protective rollcage which provides room for several personnel in the rear section along with one driver and a passenger in the front seats. Unlike other M12 FAV variants, it has an SLED spot light on top of the roll cage. A high-powered spotlight is also fitted to the Warthog. Unlike other Warthog variants, the M831 lacks any standard armament, (such as the M41 Light Anti-Aircraft Gun used by the M12 Light Reconnaissance Vehicle). As such, a driver must rely on of his passengers' armament for offensive and defensive firepower. The usage of a troop compartment instead of a turret affords a 360 degree overlapping field of fire: this can be used to deadly effect when passengers carry an even distribution of anti-personnel and anti-vehicle weapons. Unfortunately, passengers riding behind the cab are highly exposed to enemy fire, much like the gunners on more typical Warthog variants. The M831 Warthog has four sub-variants that only differ in minor ways: M831A, M831B, M831C, and M831D. The New Mombasa Police Department made use of a variant, dubbed the NMPD Warthog. On July 24, 2552, SPARTAN-B312 was transported to a UNSC camp to join NOBLE Team by an M831 TT. Two days later, when the Covenant attacked ONI SWORD Base during the opening actions of the Fall of Reach, UNSC Army troopers from 3 Echo utilized an M831 TT to return to their base, but were killed by Wraiths before reaching SWORD Base's gates. On October 20 in the same year, Marines fighting in New Mombasa made use of numerous M381 TTs on the city's waterfront highway. While their operators were killed, the M381 TTs remained intact until the city was glassed the next morning by a Covenant fleet. As the Battle of Earth drew to an end, the UNSC base codenamed Crow's Nest was attacked by the Covenant. Spartan John-117, after detonating a bomb in the base, drove a transport Warthog with a group of surviving Marines out of the destroyed base and managed to get back into contact with Lieutenant Commander Miranda Keyes. Another M381 TT was dropped by a D77H-TCI Pelican for John-117 and a squad of Marines to fight past the Covenant defense and clear a path to Voi. Another was utilized on the Ark, allowing John-117 and a group of Marines to rapidly deploy from one of the shielding towers around the Ark's core to the beach for airlift. Equipping all available Marines with fuel rod guns, (a tactic commonly known as the "Death Blossom" or "Green Ring of Death"), allows the Marines to provide a near-constant barrage of multidirectional firepower. This is extremely effective against infantry and very potent against vehicles. It can also be attempted with rocket launchers (the "Steel Flower") but the lower rate of fire of the launcher compared to the FRG reduces its effectiveness significantly. In the campaign level The Storm, the Troop Transport Warthog found in the first lakebed area can be carried through to the next Traxus factory, where there is a rack of rocket launchers that the player can give to the Marines. This is helpful against the anti-air Wraiths and the Scarab. It's possible to cause the Troop Transport on ONI Sword Base to survive of your own volition. You will require a Plasma Pistol and the Sprint Armor Ability. When you get to the section where the Warthog appears, sprint as fast as you can towards it and EMP it with the Plasma Pistol. Then, take the driver's seat and get it as far away from the Wraiths as you can. Unless something goes wrong, it should make it through the fight. There are many slightly hidden power weapons on Sword Base, so the passengers on this Warthog can be well equipped. If you are playing the level co-op, a Troop Transport will be dropped with the first Warthog deployed. 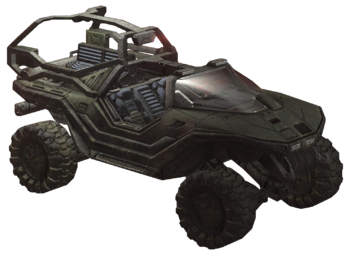 The M831 Troop Transport vehicle was originally slated to be in Halo 2 along with two other Warthog variants, the "Snow Warthog" and the "Jungle Warthog". Time constraints prevented Bungie from adding it to the game; the only new variant that made it into Halo 2 was the "Gauss" Warthog. The M831 Troop Transport is not typically usable in Halo: Reach. It first appears in the cutscene Noble Actual, then later in the level, ONI: Sword Base, making a scripted drive before being destroyed. Occasionally, however, the vehicle will survive, or the script will not work properly, resulting in an undamaged, fully functioning Warthog spawning nearby. On the Halo 3 multiplayer level The Pit, a Troop Transport Warthog rests outside the level boundaries. A player can spawn a gravity lift in Forge and use it to push the Warthog into the level. However, only the connection host can drive it. Players can order Marines out of the back seats even though they themselves cannot sit back there. Concept art of the M831 for Halo: Reach. Note the 2nd Armored Division emblem. 3D high-poly renders of the M831 Troop Transport 'Hog for Halo: Reach. Alternate view of a vacant M831 Troop Transport Warthog in Halo 3. John-117 driving an M831 Warthog in Halo 3. An unused M831 Warthog Troop Transport in Halo 3. A Troophog on Tsavo Highway. Troop Transport Warthog on "The Pit" multiplayer level. The Troop Warthog in Halo: Reach. The NMPD variant of the M831.